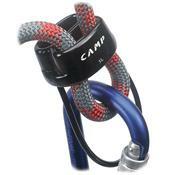 Even with the hundreds of belay devices available, simple, functional tube styles like the CAMP Shell Belay Device still rule for obvious reasonsa"they're simple and functional. The 1.7-ounce CAMP Shell Belay Device operates smoothly on single ropes from 10-11mm and allows double-rope rappels on lines down to 8mm. No moving parts to jam, no hidden internal cams to clog with dirt.